The North Coast Chorale (NCC) is a welcoming, community-based, non-profit organization dedicated to presenting great choral literature and promoting music education. Established over 25-years ago, we sing a variety of musical genres including jazz, gospel, sacred and traditional music. LGAs part of Clatsop Community College Arts & Ideas program, the Chorale mentors young singers. The Chorale presents two main concerts – a December winter concert and a May spring concert. 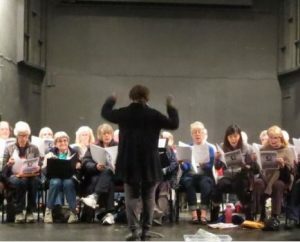 Each year the Chorale helps community fund-raising events, such as the Messiah Sing-along, presented in collaboration with the Astoria Christian Church and Thrivent Financial to raise money for the local Food Bank. The NCC partners with the Cascadia Concert Opera of Eugene in operatic productions. We also participate in the annual Astoria Music Festival, the winter North Coast Symphonic Band concert, and those that wish to, sing carols at the lighting of the lights in downtown Astoria and sing for the Scandinavian Festival of Lights in late November. Interested in Joining? We are always looking for new singers!